Just like that, Mike McCarthy's decision backfires. 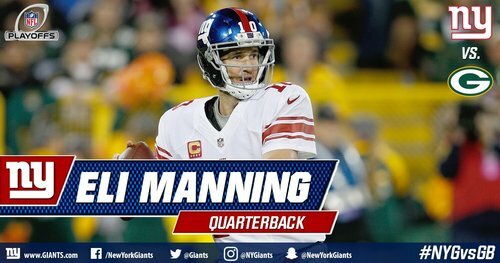 Manning to King for a 41-yard touchdown. 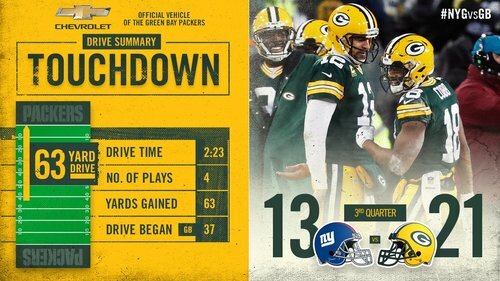 #Packers 14, Giants 13. Game on. 2 plays later Manning to Tavarres King Beating Damarious Randall in single coverage TD. #Packers now lead 14-13 with 5:16 left in third. Really good inside move by #Packers WR Randall Cobb to shake Trevin Wade. Aaron Rodgers put it on the money. That's quite a response from the #Packers . Rodgers moves the ball downfield easily and hits Cobb for a 30-yard score. Green Bay up 21-13. 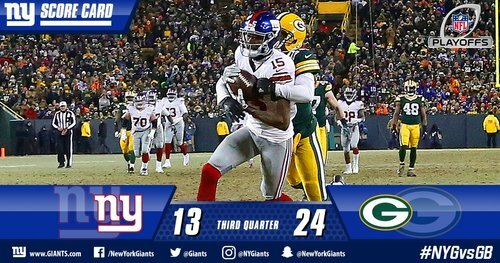 If the #Giants were going to take the fourth-down failure and their TD and seize momentum, Rodgers, Cook, Adams and Cobb took care of it. #Packers WR Randall Cobb has 13 catches, 208 yards and a TD vs. Giants this year. He has 51 catches, 502 yards and 3 TDs vs. everyone else. 4 catches for 100 yards & 2 TDs now for @rcobb18 ! Another big play by the #Packers defense. Julius Peppers deflected the pass on third down to force a punt. Wing in his own end zone. He turns 37 years old in 10 days, folks. And Julius Peppers has been the biggest difference for #Packers defense in this game. @AaronRodgers12 finds No. 18 for their second TD connection. 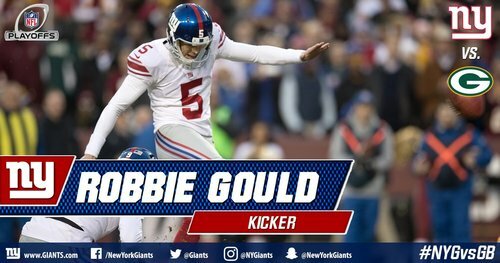 Short field leads to a 32-yard field goal by Mason Crosby after Rainey's mistake. #Packers lead 24-13. Randall Cobb vs. Giants this year: 13 catches, 208 yards, 2 TDs. Odell Beckham Jr. vs #Packers this year: 9 catches, 84 yards, TD. In last seven games (including this one), Rodgers has thrown 18 touchdowns and no interceptions. #Packers lead with a quarter to go! 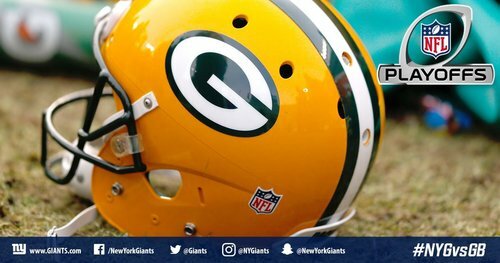 Giants have outgained the Packers, 288 to 272. Jake Ryan, blanket coverage on Odell Beckham Jr. What? ?